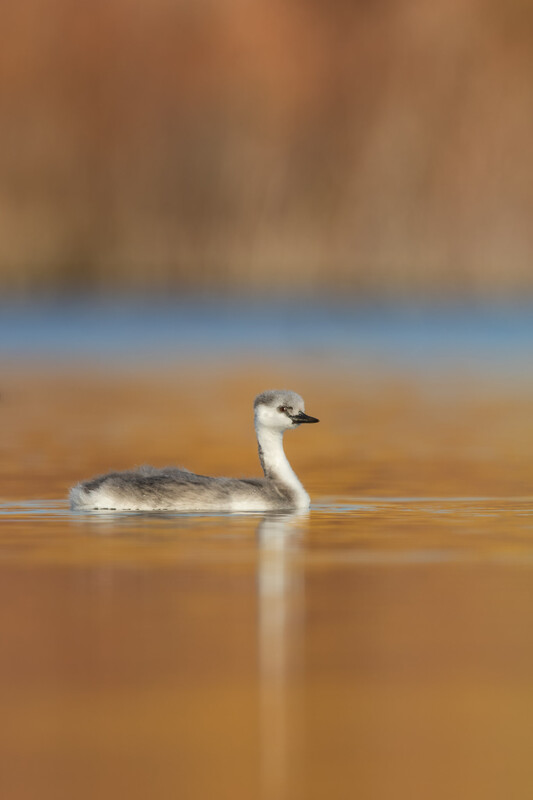 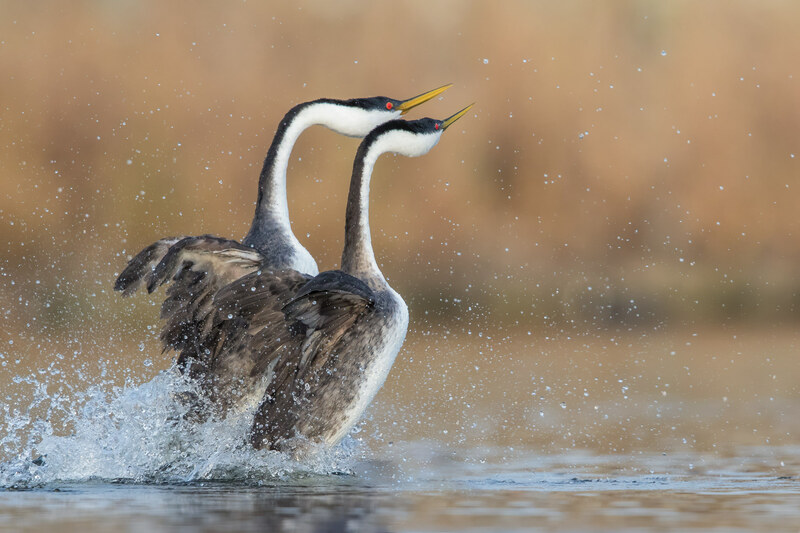 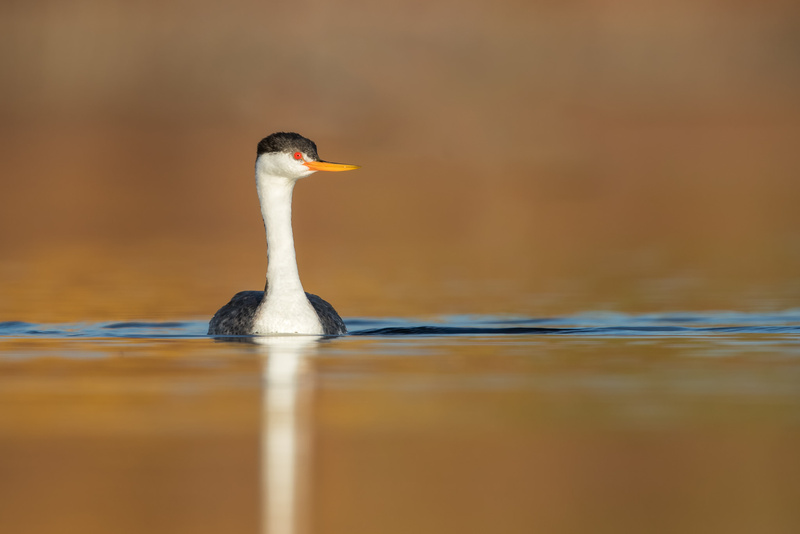 The western grebe is the largest North American grebe. 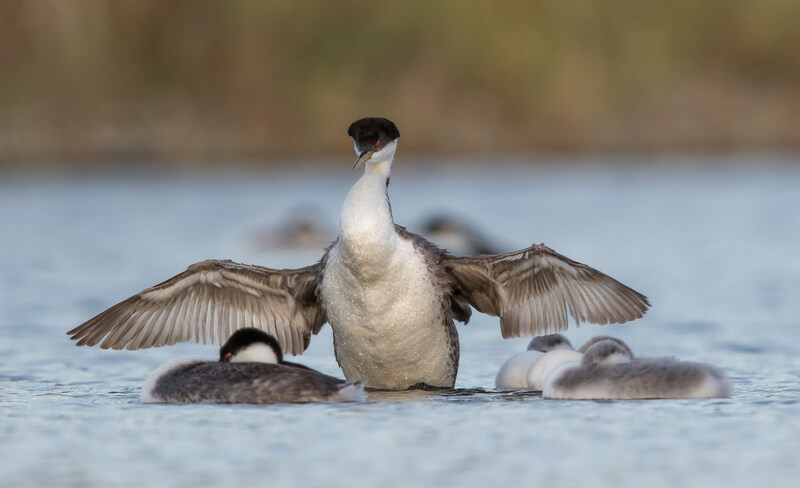 It is 55–75 cm (22–30 in) long, weighs 795–2,000 g (1.753–4.409 lb) and measures 79–102 cm (31–40 in) across the wings. 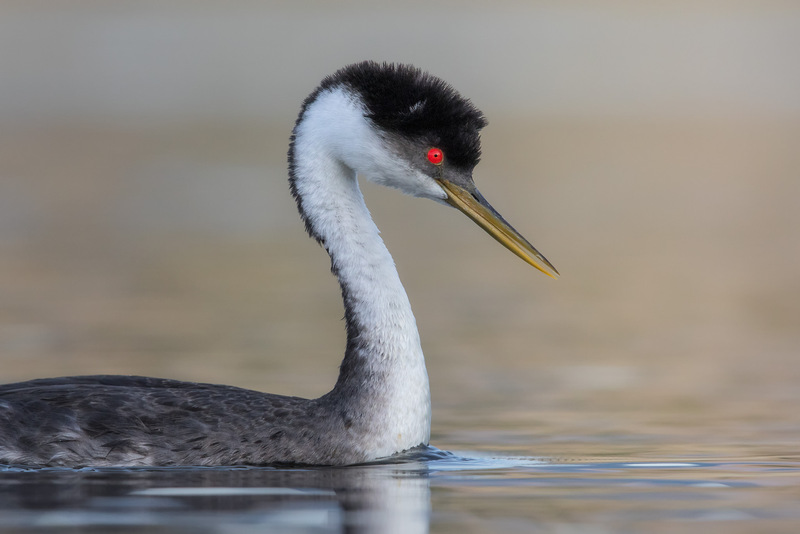 It is black-and-white, with a long, slender, swan-like neck and red eyes. 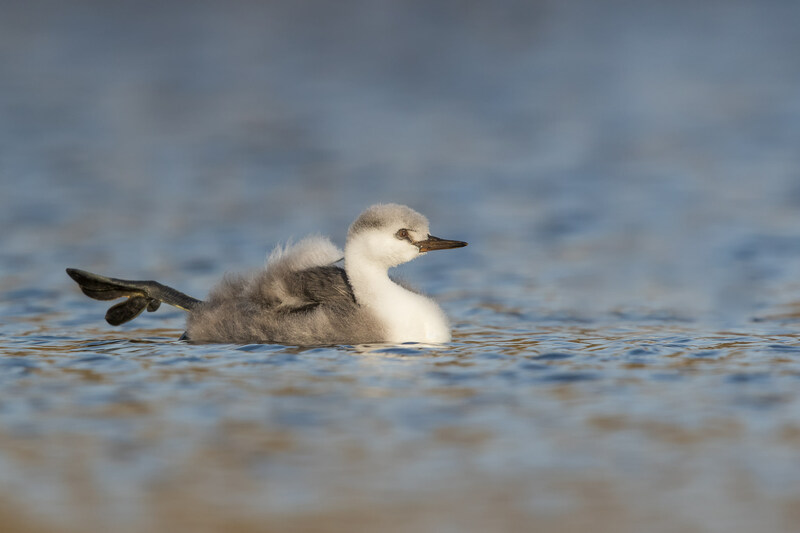 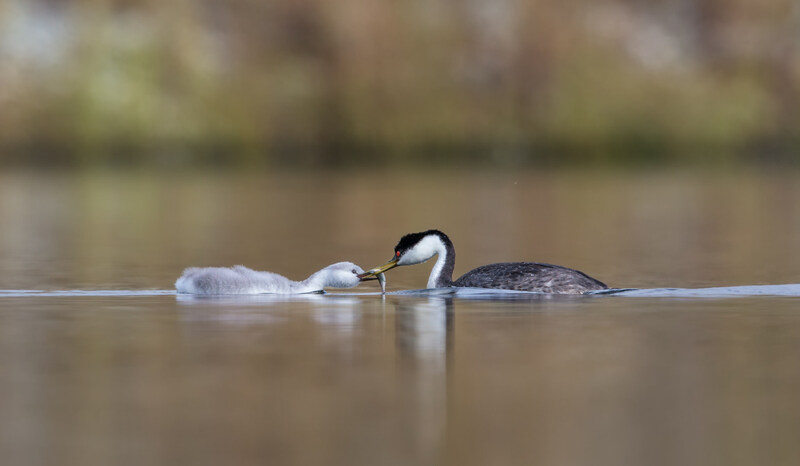 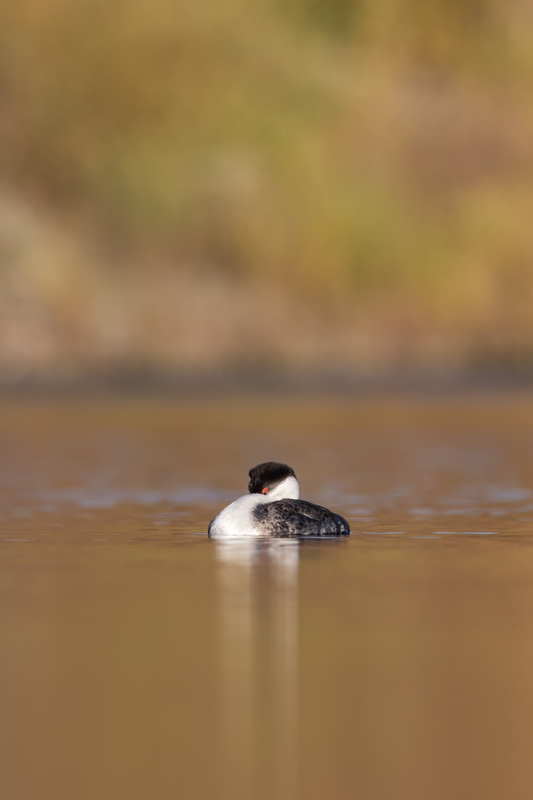 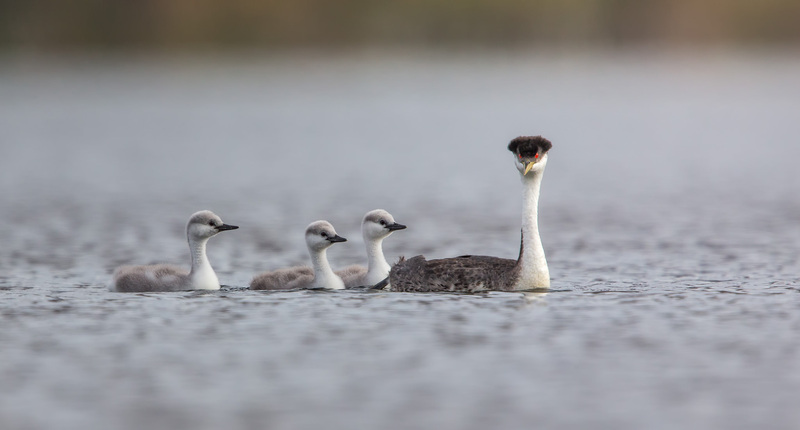 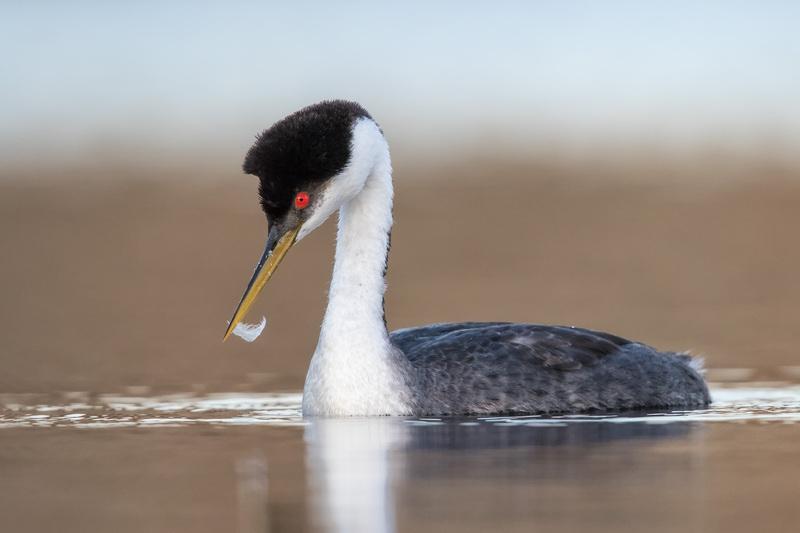 It is easily confused with Clark’s grebe, which shares similar features, body size, behavior and habitat, and hybrids are known. 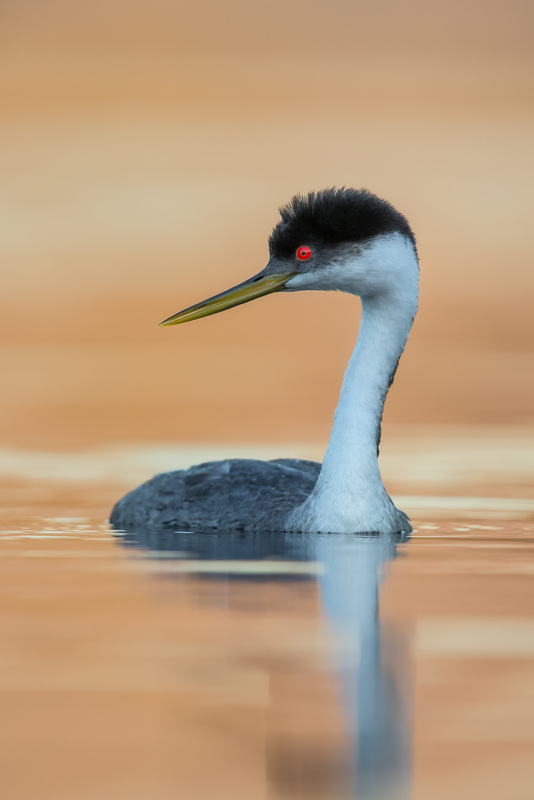 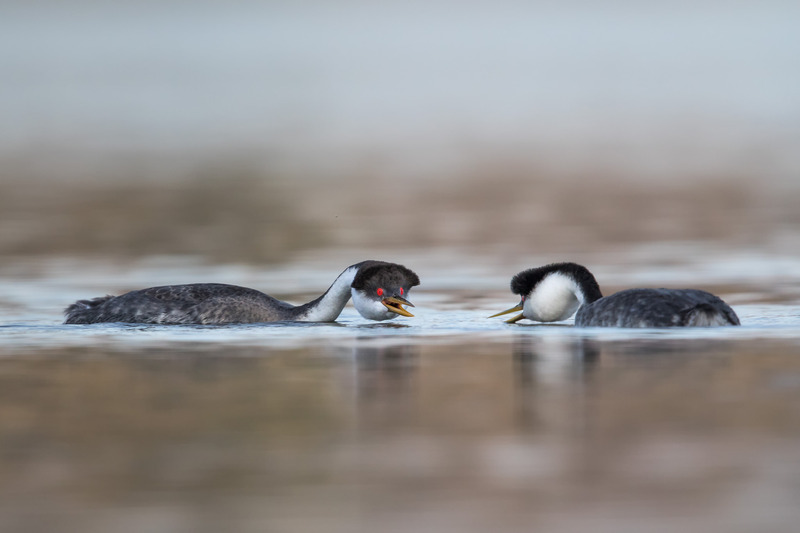 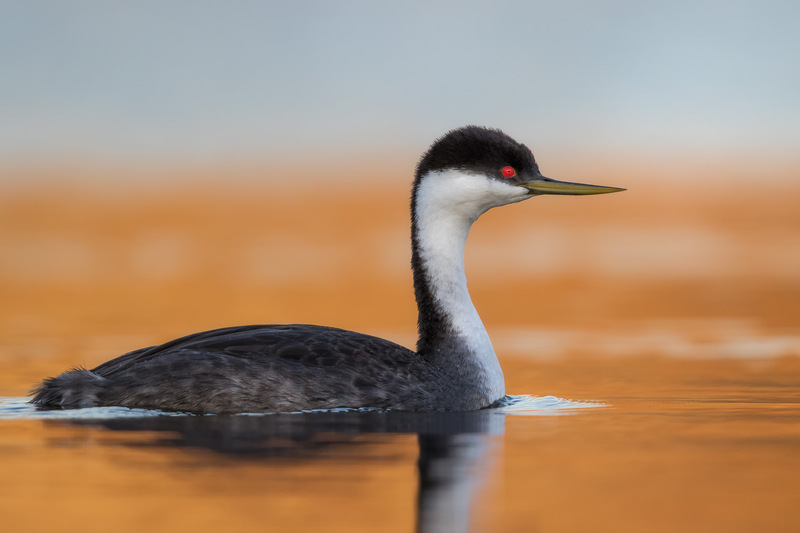 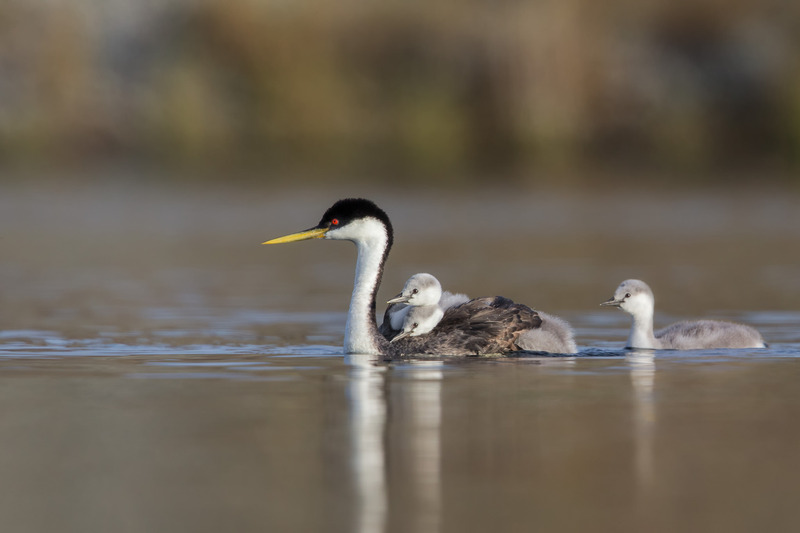 The western grebe has black around the eyes and a straight greenish-yellow bill whereas the Clark’s grebe has white around the eyes and an up-turned bright yellow bill. 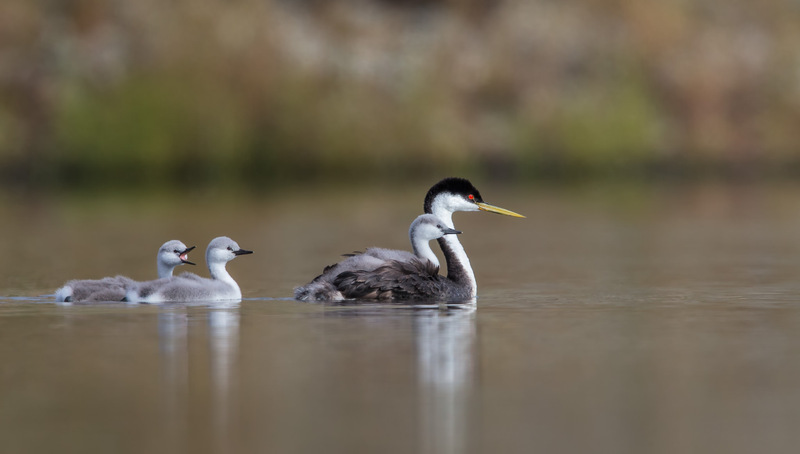 The downy young of Western are grey; Clark’s downy young are white. 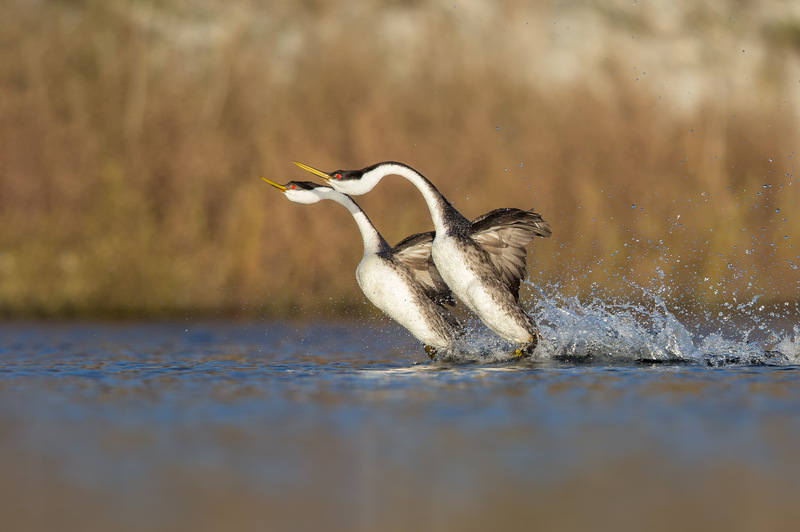 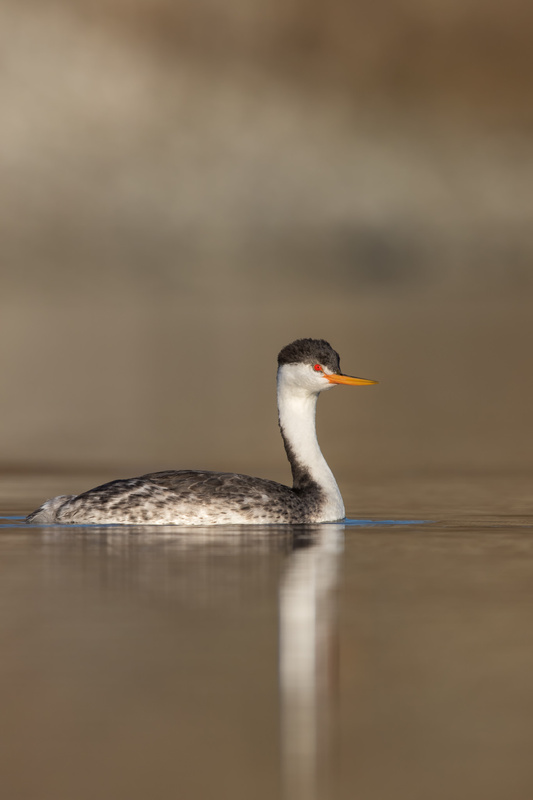 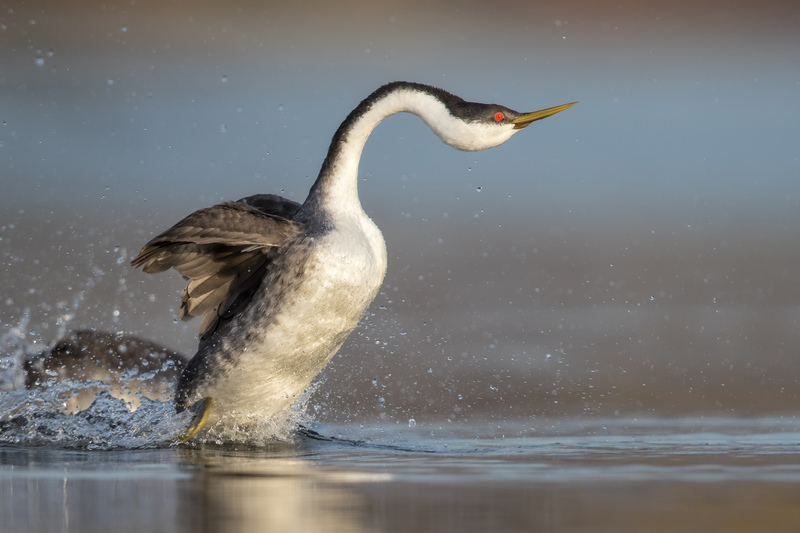 The Western Grebe, like other grebes, spends almost all its time in water and is very awkward when on land. 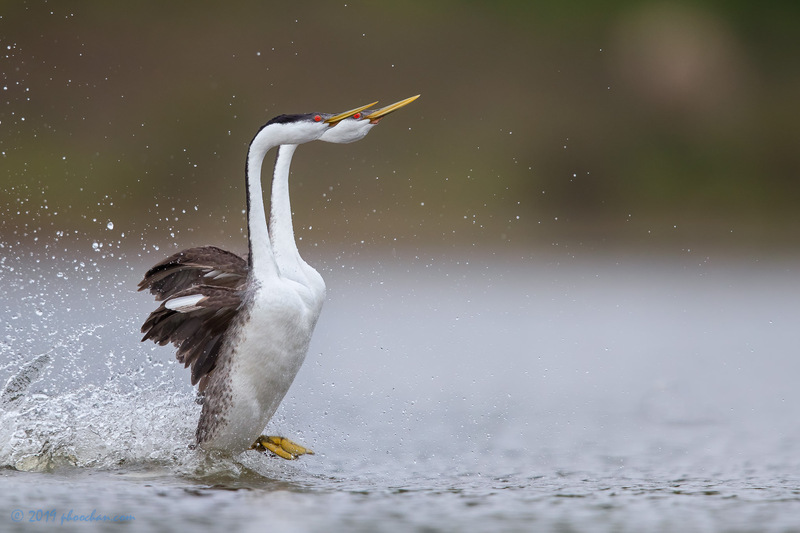 The legs are so far back on the body that walking is very difficult. 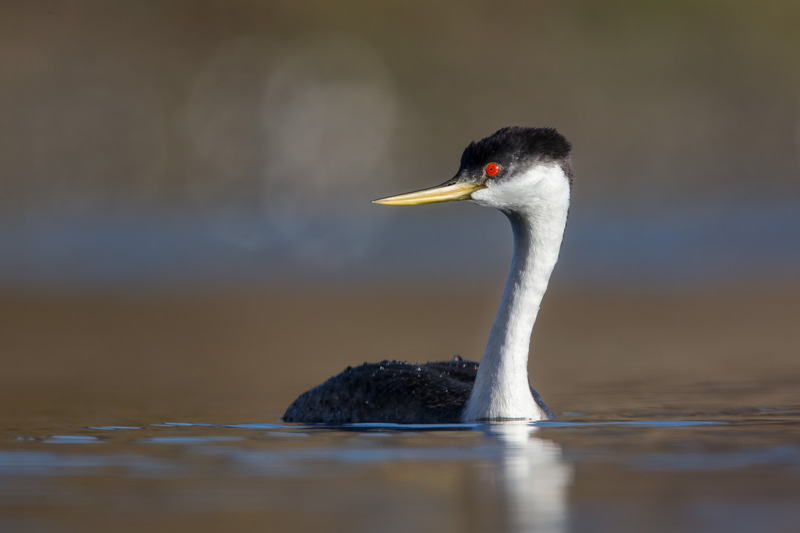 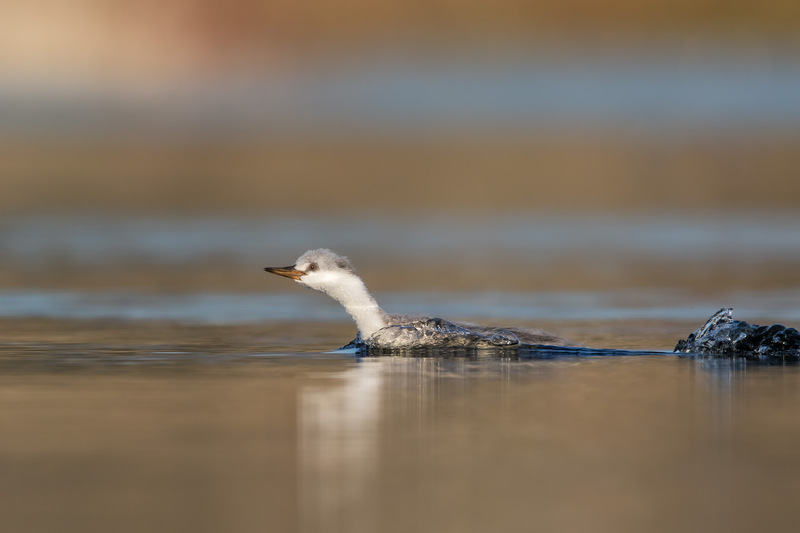 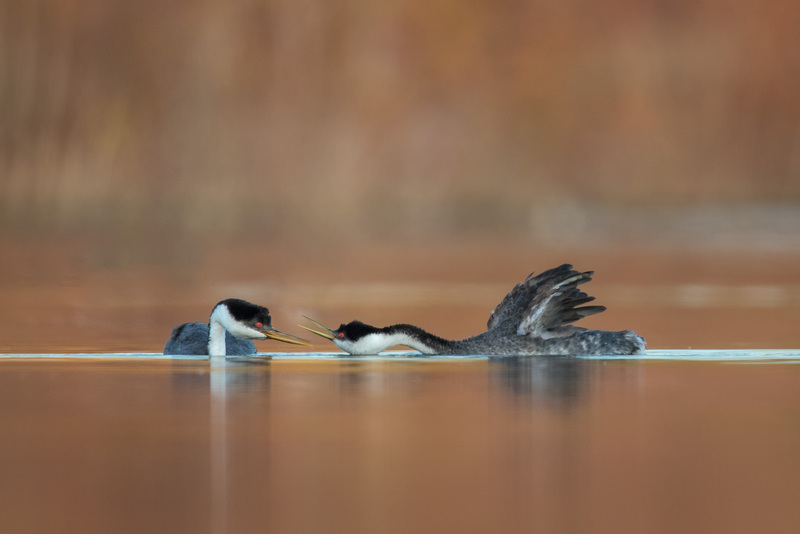 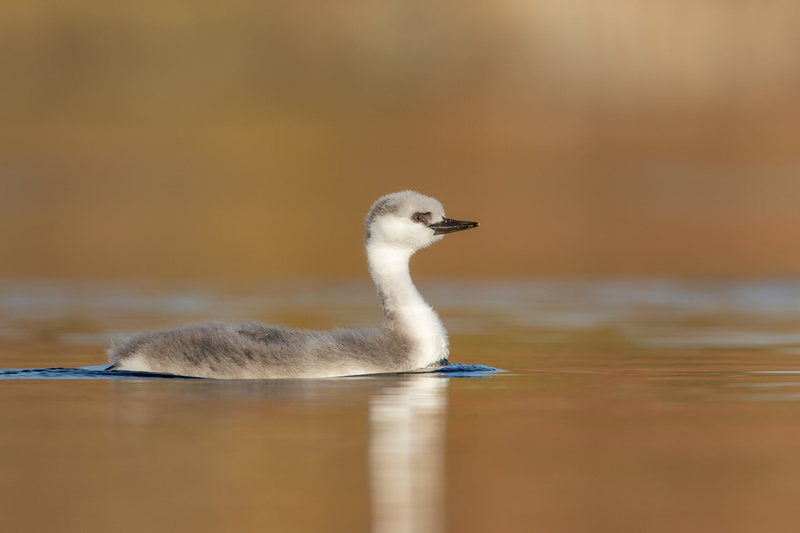 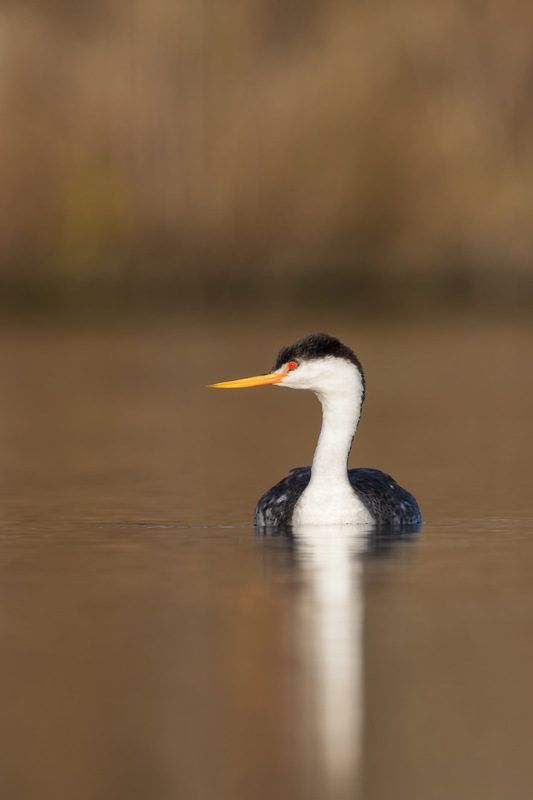 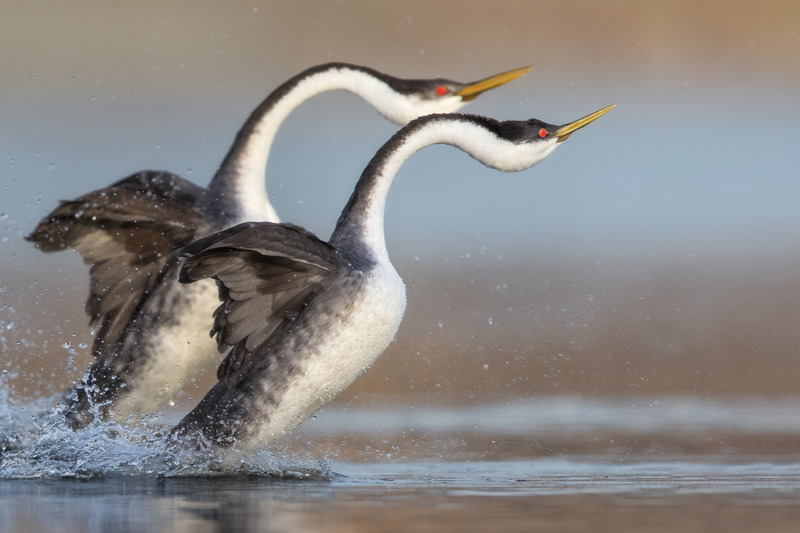 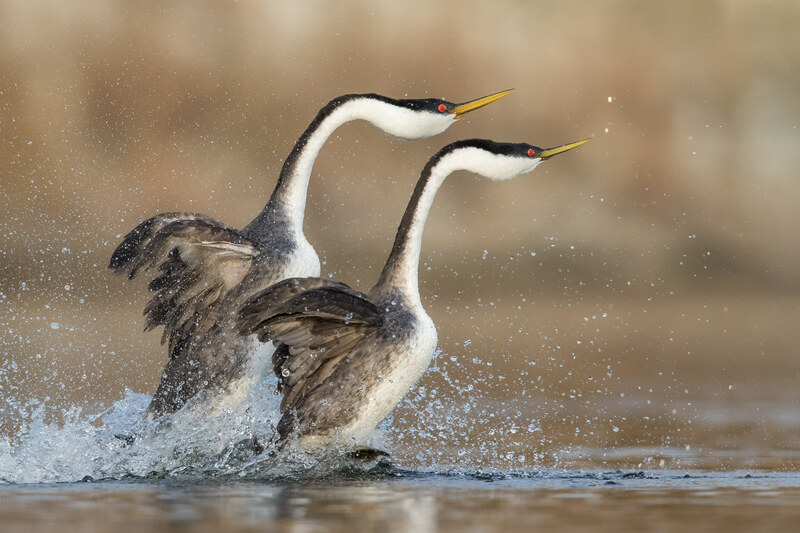 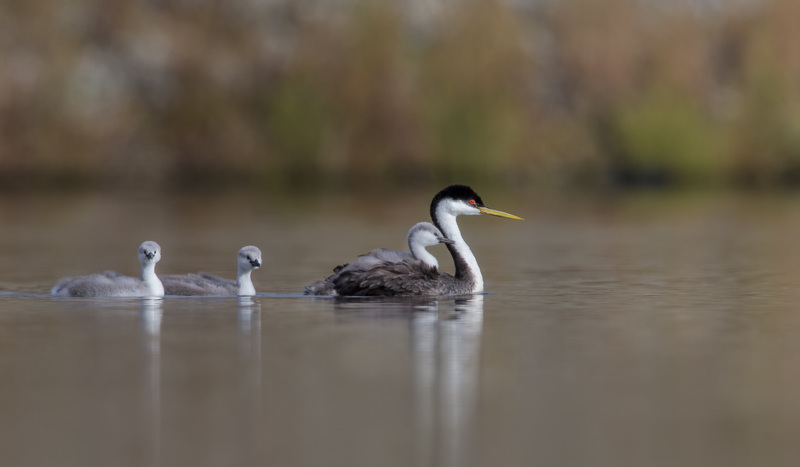 Western Grebes are adept swimmers and divers. 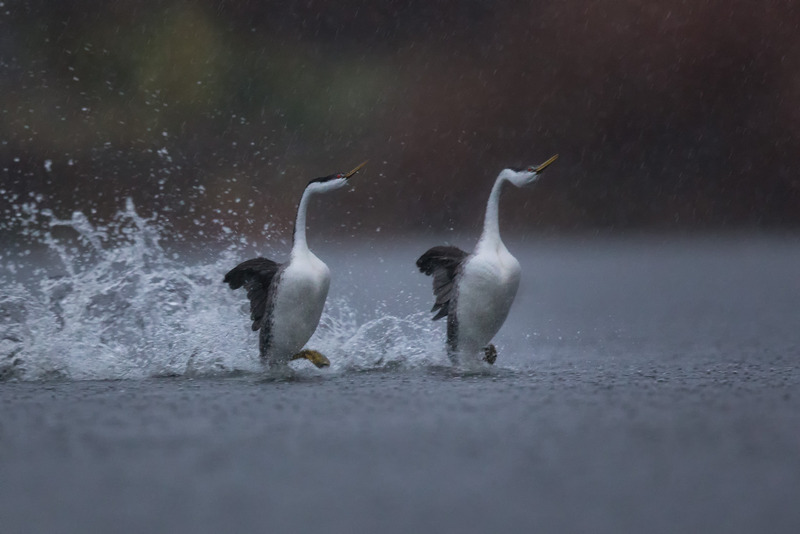 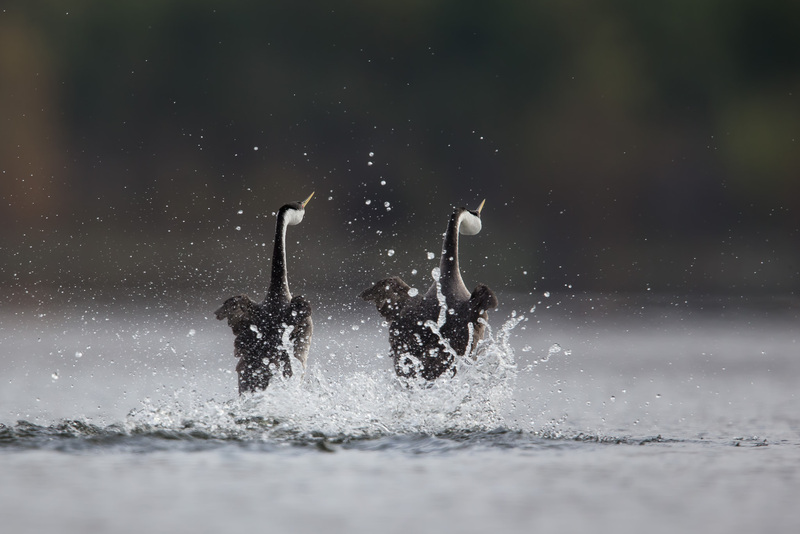 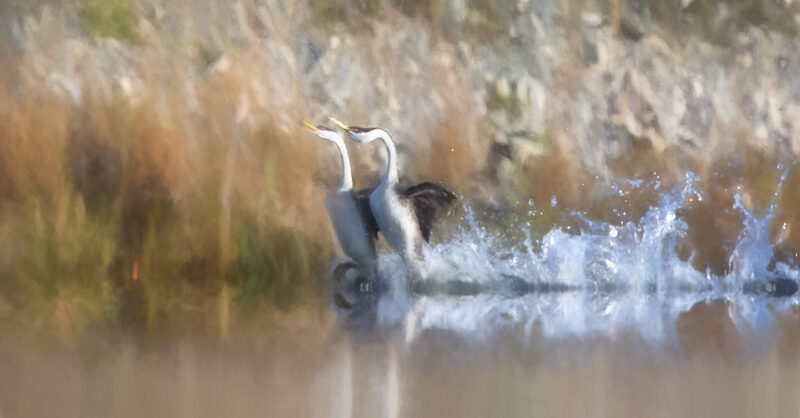 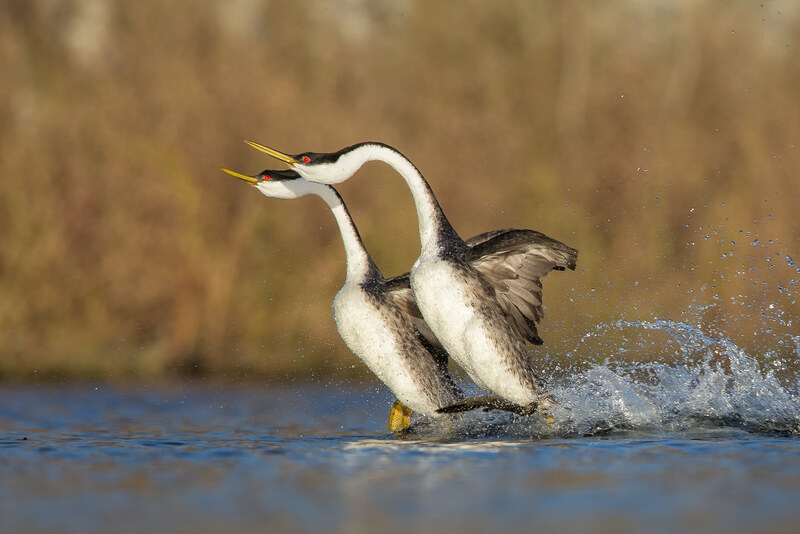 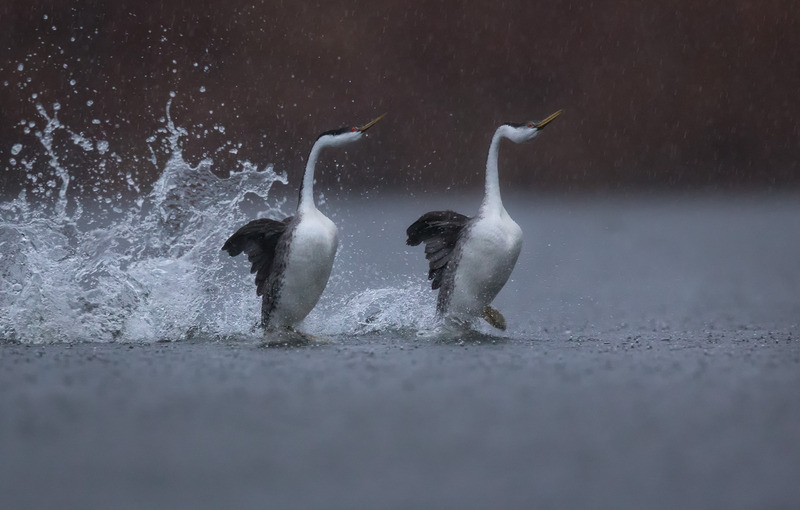 Courtship happens entirely in the water, including a well-known display known as “rushing,” where two birds turn to one side, lunge forward in synchrony, their bodies completely out of the water, and race across the water side by side with their necks curved gracefully forward. 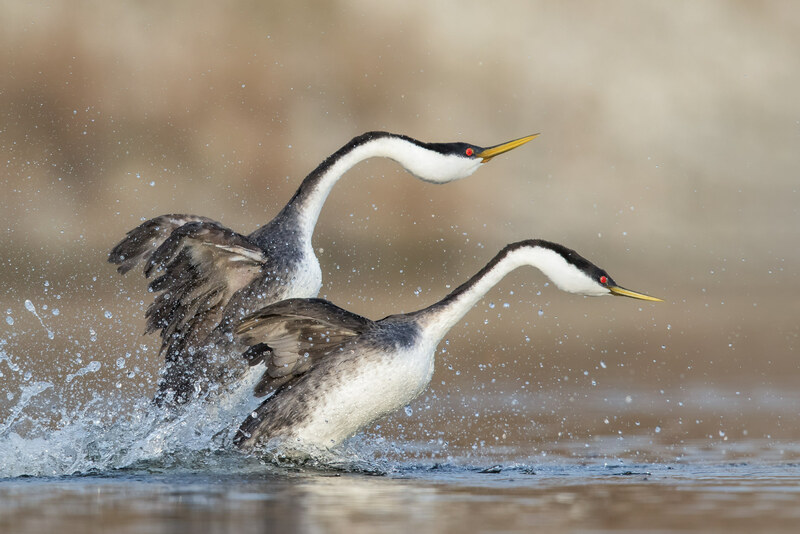 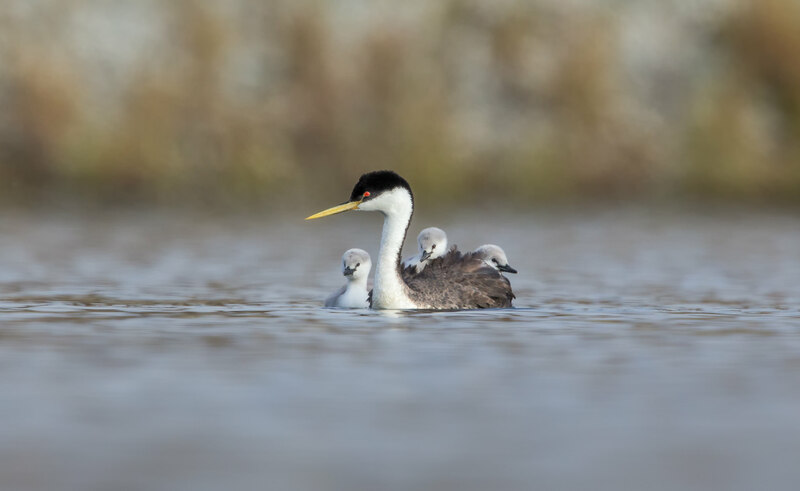 Western grebes nest in colonies of hundreds on large inland lakes, sometimes using coastal marshes, in western North America. 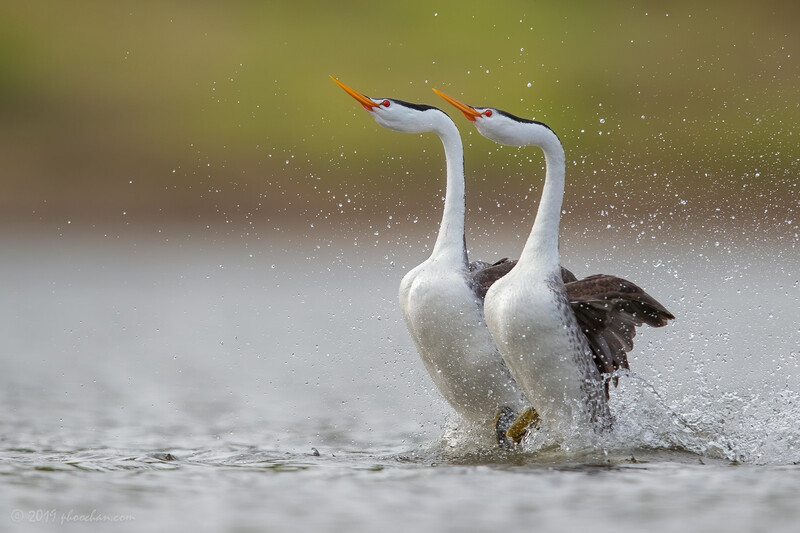 It has a spectacular courtship display; two birds will rear up and patter across the water’s surface. 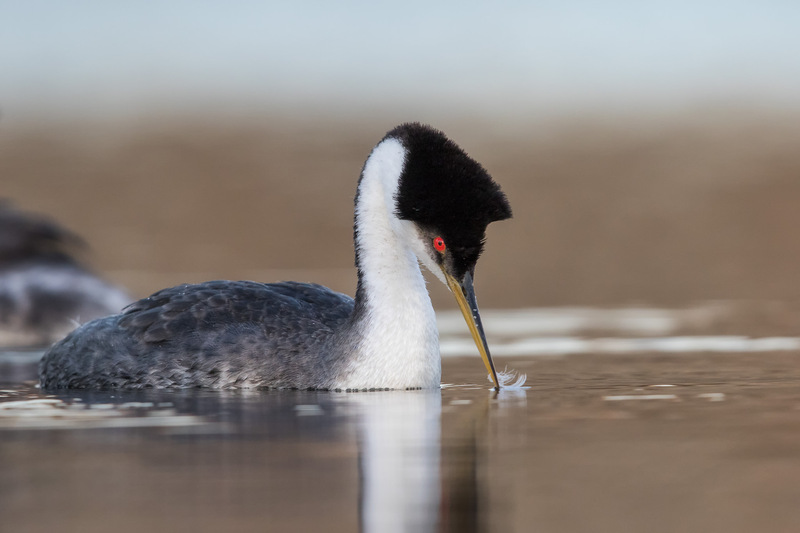 Northern birds migrate west to coastal ocean in winter; birds in the southwest and Mexico may be permanent residents.